This is the last post of the Frankie Manning week series. While doing some research for my Frankie Manning week here on Shuffle Projects, I found another gem on the web: A beautifully designed online-magazine called FLYP. 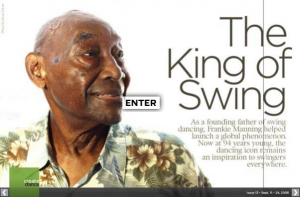 Read and watch the article about Frankie “The King Of Swing” by Amy Van Vechten, issued on 10th September 2008. UPDATE: Apperently, the online magazine doesn't exist anymore. Therefore, I deleted the links.